What is a Junction Field Effect Transistor? A JFET is a semiconductor with 3 terminals, available either in N-channel or P-channel types. It is unipolar but has similar characteristics as of its Bipolar cousins. 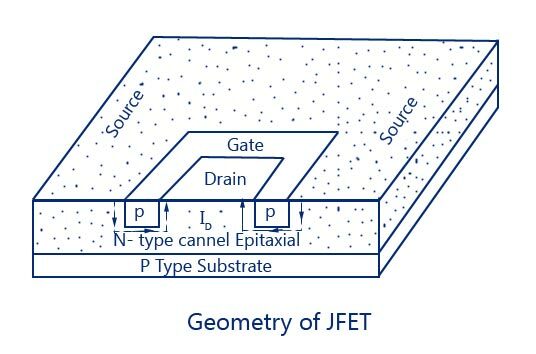 Instead of PN junctions, a JFET uses an N-type or P-type semiconductor material between the collector and emitter (Source & Drain). The N-type material is made by doping Silicon with donor impurities so that the current flowing through it is negative. Similarly, the P-type material is doped with acceptor impurities so the current flowing through them is positive. N-type JFET is more commonly used because they are more efficient due to the fact that electrons have high mobility. 1. Output or Drain Characteristic. The circuit diagram for determining the drain characteristic with shorted-gate for an N-channel JFET is given in figure. and the drain characteristic with shorted-gate is shown in another figure. Initially when drain-source voltage Vns is zero, there is no attracting potential at the drain, so no current flows inspite of the fact that the channel is fully open. This gives drain current Ip = 0. For small applied voltage Vna, the N-type bar acts as a simple semiconductor resistor, and the drain current increases linearly with_the increase in Vds, up to the knee point. This region, (to the left of the knee point) of the curve is called the channel ohmic region, because in this region the FET behaves like an ordinary resistor. With the increase in drain current ID, the ohmic voltage drop between the source and channel region reverse-biases the gate junction. The reverse-biasing of the gate junction is not uniform throughout., The reverse bias is more at the drain end than that at the source end of the channel, so with the increase in Vds, the conducting portion of the channel begins to constrict more at the drain end. Eventually, a voltage Vds is reached at which the channel is pinched off. The drain current ID no longer increases with the increase in Vds. It approaches a constant saturation value. The value of voltage VDS at which the channel is pinched off (i.e. all the free charges from the channel get removed), is called the pinch-off voltage Vp. The pinch-off voltage Vp, not too sharply defined on the curve, where the drain current ID begins to level off and attains a constant value. From point A (knee point) to the point B (pinch-off point) the drain current ID increases with the increase In voltage Vds following a reverse square law. The region of the characteristic in which drain current ID remains fairly constant is called the pinch-off region. It is also sometimes called the saturation region or amplifier region. In this region the JFET operates as a constant current device sincedrain current (or output current) remains almost constant. It is the normal operating region of the JFET when used as an amplifier. The drain current in the pinch-off region with VGS = 0 is referred to the drain-source saturation current, Idss). where ID is the drain current at a given gate-source voltage VGS, IDSS is the drain-current with gate shorted to source and VGS (0FF) is the gate-source cut-off voltage. If the drain-source voltage, Vds is continuously increased, a stage comes when the gate-channel junction breaks down. At this point current increases very rapidly. and the JFET may be destroyed. This happens because the charge carriers making up the saturation current at the gate channel junction accelerate to a high velocity and produce an avalanche effect. (1) The maximum saturation drain current becomes smaller because the conducting channel now becomes narrower. (2) Pinch-off voltage is reached at a lower value of drain current ID than when VGS = 0. When an external bias of, say – 1 V is applied between the gate and the source, the gate-channel junctions are reverse-biased even when drain current, ID is zero. Hence the depletion regions are already penetrating the channel to a certain extent when drain-| source voltage, VDS is zero. Due to this reason, a smaller voltage drop along the channel (i.e. smaller than that for VGS = 0) will increase the depletion regions to the point where 1 they pinch-off the current. Consequently, the pinch-off voltage VP is reached at a lower 1 drain current, ID when VGS = 0. (3) The ohmic region portion decreases. (4) Value of drain-source voltage VDS for the avalanche breakdown of the gate junction is reduced. Hence for working of JFET in the pinch-off or active region it is necessary that the following conditions be fulfilled. The transfer characteristic can also be derived from the drain characteristic by noting values of drain current, IDcorresponding to various values of gate-source voltage, VGS for a constant drain-source voltage and plotting them. It may be noted that a P-channel JFET operates in the same way and have the similar characteristics as an N-channel JFET except that channel carriers are holes instead of electrons and the polarities of VGS and VDS are reversed. 2. It is simpler to fabricate, smaller in size, rugged in construction and has longer life and higher efficiency. Simpler to fabricate in IC form and space requirement is also lesser. 3. It has a high input impedance (of the order of 100 M Q), because its input circuit (gate to source) is reverse biased, and so permits high degree of isolation between the input and the output circuits. However, the input circuit of an ordinary transistor is forward biased and, therefore, an ordinary transistor has low input impedance. 5.Â Â Â An ordinary transistor uses a current into its base for controlling a large current between collector and emitter whereas in a JFET voltage on the gate (base) terminal is used for controlling the drain current (current between drain and source). 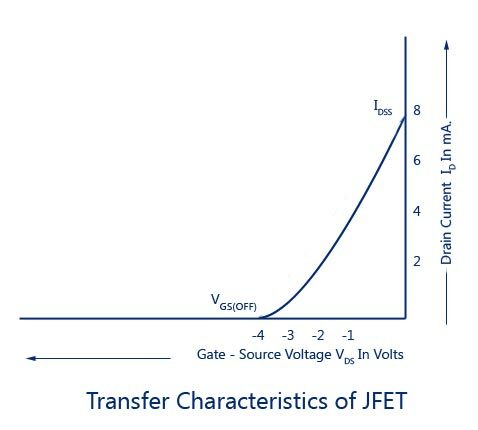 Thus an ordinary transistor gain is characterized by current gain whereas the JFET gain is characterized as the transconductance (the ratio of drain current and gate-source voltage). 6.Â Â Â JFET has no junction like an ordinary transistor and the conduction is through bulk material current carriers (N-type or P-type semiconductor material) that do not cross junctions. Hence the inherent noise of tubes (owing to high-temperature operation) and that of ordinary transistors (owing to junction transitions) is not present in JFET. 7.Â Â Â It is relatively immune to radiation. 8.Â Â Â It has negative temperature coefficient of resistance and, therefore, has better thermal stability. 9.Â Â Â It has high power gain and, therefore, the necessity of employing driver stages is eliminated. 10.Â Â Â It exhibits no offset voltage at zero drain current and, therefore, makes an excellent signal chopper. 11.Â Â Â It has square law characteristics and, therefore, it is very useful in the tuners of radio and TV receivers. 12.Â Â Â It has got a high-frequency response. 1. Its relative small gain-bandwidth product in comparison with that of a conventional transistor. 2. Greater susceptibility to damage in its handling. 3. JFET has low voltage gains because of small transconductance. 4. Costlier when compared to BJTâ€™s. A bit srupriesd it seems to simple and yet useful.